In MoveIt!, the simplest user interface is through the MoveGroupInterface class. It provides easy to use functionality for most operations that a user may want to carry out, specifically setting joint or pose goals, creating motion plans, moving the robot, adding objects into the environment and attaching/detaching objects from the robot. This interface communicates over ROS topics, services, and actions to the MoveGroup Node. Watch this quick YouTube video demo to see the power of the move group interface! Note: This tutorial uses the RvizVisualToolsGui panel to step through the demo. To add this panel to RViz, follow the instructions in the Visualization Tutorial. After a short moment, the RViz window should appear and look similar to the one at the top of this page. To progress through each demo step either press the Next button in the RvizVisualToolsGui panel at the bottom of the screen or select Key Tool in the Tools panel at the top of the screen and then press N on your keyboard while RViz is focused. The robot moves its arm to the pose goal to its front. The robot moves its arm to the joint goal at its side. 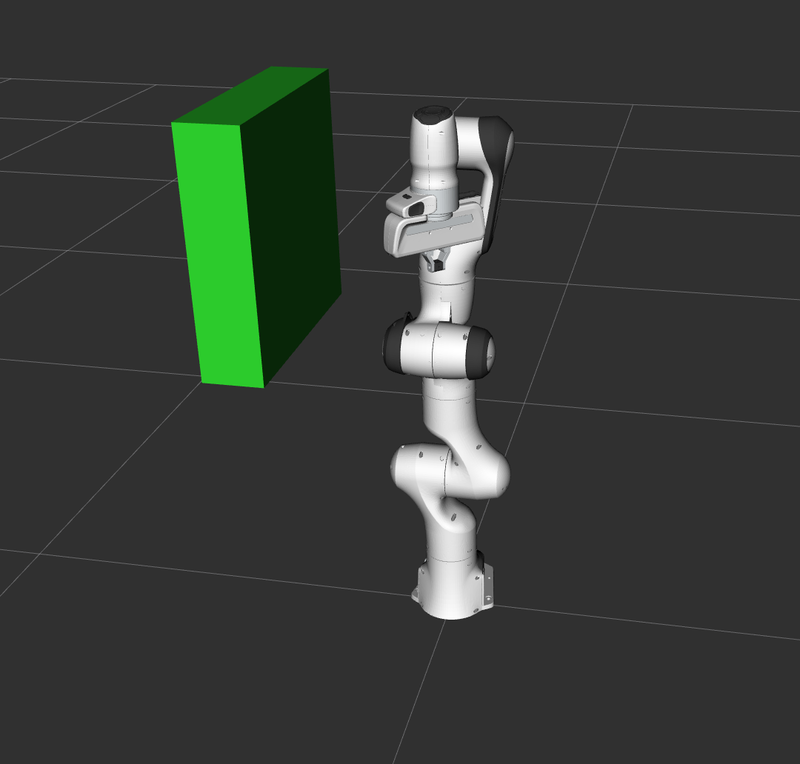 The robot moves its arm back to a new pose goal while maintaining the end-effector level. The robot moves its arm along the desired Cartesian path (a triangle down, right, up+left). A box object is added into the environment to the right of the arm. 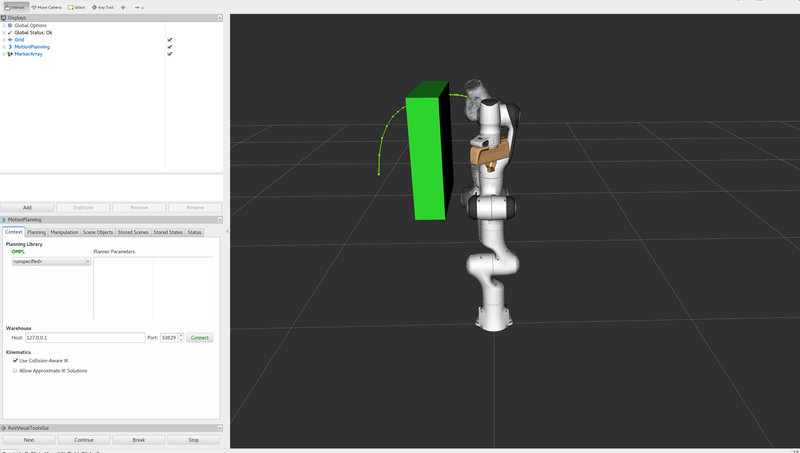 The robot moves its arm to the pose goal, avoiding collision with the box. The object is attached to the wrist (its color will change to purple/orange/green). The object is detached from the wrist (its color will change back to green). The object is removed from the environment. The entire code can be seen here in the MoveIt! GitHub project. Next we step through the code piece by piece to explain its functionality. MoveIt! operates on sets of joints called “planning groups” and stores them in an object called the JointModelGroup . Throughout MoveIt! the terms “planning group” and “joint model group” are used interchangably. The MoveGroupInterface class can be easily setup using just the name of the planning group you would like to control and plan for. Raw pointers are frequently used to refer to the planning group for improved performance. We can print the name of the reference frame for this robot. We can also print the name of the end-effector link for this group. We can plan a motion for this group to a desired pose for the end-effector. Now, we call the planner to compute the plan and visualize it. Note that we are just planning, not asking move_group to actually move the robot. We can also visualize the plan as a line with markers in RViz. Moving to a pose goal is similar to the step above except we now use the move() function. Note that the pose goal we had set earlier is still active and so the robot will try to move to that goal. We will not use that function in this tutorial since it is a blocking function and requires a controller to be active and report success on execution of a trajectory. Let’s set a joint space goal and move towards it. This will replace the pose target we set above. To start, we’ll create an pointer that references the current robot’s state. RobotState is the object that contains all the current position/velocity/acceleration data. Next get the current set of joint values for the group. Now, let’s modify one of the joints, plan to the new joint space goal and visualize the plan. Path constraints can easily be specified for a link on the robot. Let’s specify a path constraint and a pose goal for our group. First define the path constraint. Now, set it as the path constraint for the group. We will reuse the old goal that we had and plan to it. Note that this will only work if the current state already satisfies the path constraints. So, we need to set the start state to a new pose. Now we will plan to the earlier pose target from the new start state that we have just created. Planning with constraints can be slow because every sample must call an inverse kinematics solver. Lets increase the planning time from the default 5 seconds to be sure the planner has enough time to succeed. When done with the path constraint be sure to clear it. Cartesian motions are frequently needed to be slower for actions such as approach and retreat grasp motions. Here we demonstrate how to reduce the speed of the robot arm via a scaling factor of the maxiumum speed of each joint. Note this is not the speed of the end effector point. Define a collision object ROS message. The id of the object is used to identify it. Define a box to add to the world. Now, let’s attach the collision object to the robot. visual_tools.prompt("Press 'next' in the RvizVisualToolsGui window to once the collision object attaches to the "
Now, let’s detach the collision object from the robot. visual_tools.prompt("Press 'next' in the RvizVisualToolsGui window to once the collision object detaches to the "
Now, let’s remove the collision object from the world. The entire launch file is here on GitHub. All the code in this tutorial can be run from the moveit_tutorials package that you have as part of your MoveIt! setup.